The Internet Banking is the new method with significant growth in the banking industry because it offers better services to customers and the cost of providing services in banks has also been reduced. The purpose of this study is to investigate the relationships of adoption, satisfaction and Word of Mouth in the internet banking users in Iran. Data was collected by conducting a field survey questionnaire completed by 385 users of internet banking service of Iran's private banks. 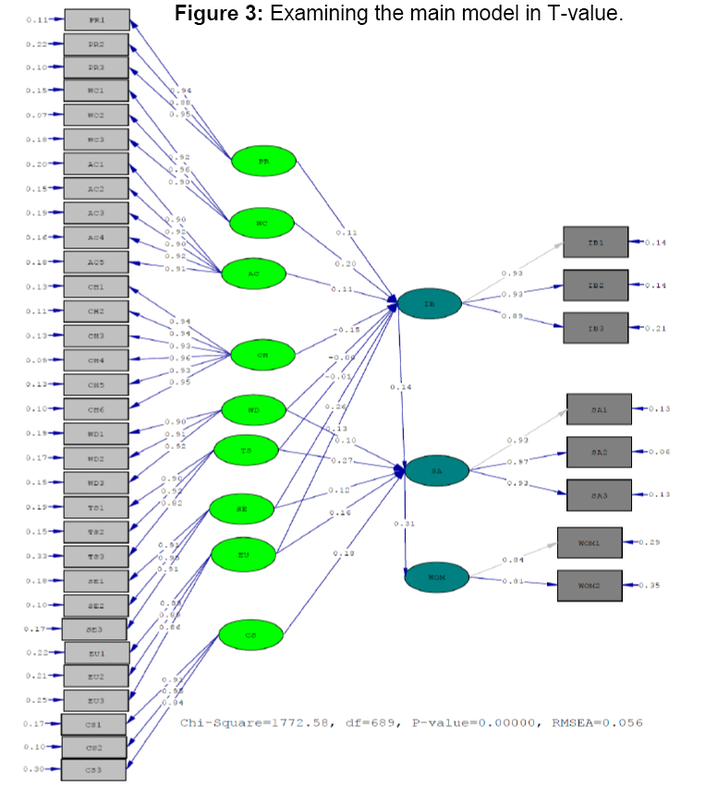 Structural equation modeling was used to analyze data and test research hypotheses. Findings indicated that Ease of use, Website content, Accessibility, Privacy, Transmission speed, and Security have positive effects on the Internet Banking Adoption. And Internet Banking Adoption leads to increased Satisfaction and Word of Mouth. Furthermore, research limitations and future directions have been discussed in the last section. The Information Technology (IT) development has had a huge impact on all aspects of human life; and this revolution, which is based on the IT in the provision of bank services, has also made significant changes and allowed customers to use their time more efficiently [1,2] and thus customers are willing to adopt new service and products [3,4]. The IT development has created a framework for facilitating business and transaction affairs and led to the increased competition of companies and organizations. Due to the widespread presence of the Internet and the ever-increasing development of Internet-based technologies, Internet services have created new ways for financial institutions to provide financial products/services to customers in many developed and developing countries . The internet banking adoption is about 97% in advanced countries such as the U.S, Germany and the United Kingdom [6-8]. In Iran, the rapid conduct of affairs and not wasting time is considered the most important elements of success in the competition of banks; and customers are the main pivotal determinants in this Competition and attach great importance to technology and speed, and then to the technical expertise of banks. Over the past two decades, the number of banks has increased dramatically in Iran, so that 19 private banks and eight public banks are now operating (According to the Central Bank of Iran, 2018). This number of banks has increased the severity of competition in this market, and they are trying to use efficient methods to gain more market share and financial revenue. According to recent statistics, approximately 70% of Iranians use the Internet . The latest World Bank statistics (2016), shows 53 percent (about 40 million people) of Iran's population uses the Internet banking services  which represents the potential market in this sector. Various studies have done in different countries which is used the "Online Banking" and "Internet Banking" instead of each other , but there are differences between the Internet and electronic banking. Electronic banking covers a wider range including the mobile banking, internet banking, telephone banking, ATM, etc. Some researchers studied the Internet bank [11-14] and mobile banking [1,15-17] in order to examine factors leading to the adoption and intention to use the services. However, there is not any comprehensive research in Iran that simultaneously examines relationships of factors affecting the customer adoption and satisfaction and WOM in Internet Banking. Four electronic banking channels include the ATM, Telephone Bank, Internet Bank and Mobile Bank exist. Internet Bank is a channel allowing users to conduct a lot of financial and non-financial affairs through bank websites [18,19]. The first online banking service was provided by the Stanford Federal Credit Union in 1994. Since then, these services have been rapidly provided worldwide . In brief, the Internet banking is a channel for providing banking services via the Internet . In the Internet banking, banking and financial transactions are carried out via the Internet, but its type of network is different from other transactions. The Internet banking uses the Internet as a worldwide network. Internet Bank is a way of reducing the costs of service delivery and increasing sales of services, and it is now one of the most important factors in the business economy . Customer satisfaction is a tool for evaluating organizational activities from customers' perspectives and is obtained based on the customer experience of consuming products or receiving services . Satisfaction is studied in various studies on the e-commerce and information system marketing, but it needs more investigation in the field of Internet banking and the results of customer satisfaction . Oliver  defined the customer satisfaction as the customer feeling after purchases or the customer attitude toward a service or product . The quality of provided services is closely related to the customer satisfaction  and customer trust and loyalty . The customer satisfaction is more important in the financial and banking industry because the possibility of establishing long-term relationships with financial institutions and banks increases if customers have positive perceptions of services . A great number of users use online banking across the world, and thus it is important to focus on the customer satisfaction . Accessibility: Accessibility is defined as users' abilities to obtain information and services from the web which include the content format; user hardware; software and settings; Internet connectivity; environmental conditions; and user abilities [28,29]. The term "web accessibility" generally means the use of web content in a way that users' abilities are maximized. For instance, providing text on a web page allows users with visual impairment to access information on a page by accessing a page reader [28-30]. Ease of use: Internet banking provides a higher degree of convenience for customers with its ease of use at any time and place. Apart from this advantage, the ease of access to computers is also a comparative advantage [31,32]. In terms of ease of use, Davis's technology acceptance model (1989) is a common model in which the perceived ease of use affects the users' attitudes and consequently their intention to use. Davis  defined the Ease of Use as the user expectation to use a system easily. Venkatesh et al. also explained that the individuals' perceptions of the system usefulness are influenced by their understanding of the easy use of systems. Security: Security can be guaranteed by providing and displaying a trusted logo from third parties . In the Internet banking, all transactions are carried out on a secure bank server via the Internet. Banks have all the necessary data and software to conduct transactions. Customers visit bank websites, log into systems, and then use Internet banking services. Banking services include the access to accounts and checking them, transferring funds between accounts, paying bills, and all sorts of new services and products for which the security plays an important role, and thus there are several protocols for the security of encrypted data packets. Customers are unaware of encryption; and banks approve certain versions of Internet browsers in order to comply with security issues . In fact, the security increases by components such as the compliance with national laws and regulations, using secure methods and appropriate technologies to keep the account information secure . Web design: Web design aims to provide a suitable design to make a website attractive. Before designing a website, it is recommended conducting polls on users of different groups, providing new services and receiving the feedback. In fact, financial institutions should test the customer access to websites with both automatic and manual tools . Website content: Pikkarainen et al. stated that what banks provided on their websites was a factor influencing the Internet banking adoption. On the other hand, high-quality designs, graphics, colors and a good image of a bank should be considered in providing the useful content. The website content contains the text, visual or audio content that is a part of user experience on a website. Web content includes the text, image, audio, video and animation . Transmission speed: The page loading speed depends on the nature of downloaded content from websites, computational hardware, and method of connection to download the information . On most websites, sample small images are displayed and users should download them for a view. Most people think that downloading infects the system, the waste time during the internet exchange and thus users do not trust in the success of transactions . Johnston  found that certain measures such as increasing the speed of information processing increase the sense of satisfaction in customers; however, operations such as increasing the trust in the equipment lead to the less dissatisfaction, and thus it is suggested considering the satisfaction deterrent factors more than the satisfaction increasing factors. Charges: Service quality features are important in the Internet banking industry because people receive the most services via the Internet. Providing high-quality services to meet consumers' needs at lower costs is a competitive advantage in the Internet banking. Some studies indicate that the Internet banking leads to lower administrative costs . Cost savings have made internet banking less costly in return for providing services for customers than the traditional banking . Customer Support Services: Joseph et al. defined the customer support services as the ability to provide feedback on problems with purchased goods and services, or the purchasing process itself as well as the ability to solve customer problems and concerns. Customer support services can be thus considered as a dimension of service quality . Word of mouth: Brown et al. argued that the Word of Mouth (WOM) was the enforcement of power on people in order to encourage them to judge goods and services and share their experiences with others. This advisory relationship plays an important role in creating the consumer behavior and attitude . WOM communication is commonly used in marketing to offer suggestions to consumers. The speed and lack of business bias towards a particular service have made it an effective source of information for customer choices . WOM can be positive or negative. Positive WOM includes good recommendations to people about products, services, or brands, but negative Word of Mouth is considered as a form of consumer complaints including negative recommendations to people about products, services and brands . Payne  argued that the WOM was the outcome and basis of customer retention, and loyal customers were more likely to have positive WOM communication, and they acted as brand advocates for a company. Despite the importance and influence of WOM communication in customers' commercial choices, a small percentage of these communications are encouraged by promotional efforts of service companies. Researchers believe that the impact of WOM on the customer buying behavior is greater than their controlled sources . WOM is a communication about goods and services between people who do not seem to be dependant on a company that manufactures goods or services. This communication may include face-to-face conversations, either by telephone, email, mobile, or other communication channels . Ainscough et al. argued that how customers communicate was an important criterion leading to the attraction of users to electronic banking. Yang and Jun  considered seven dimensions namely the Reliability, Accessibility, Ease of use, Customization, Security, Validity and Accountability for online service dimensions in redefining dimensions of traditional service quality. Joseph et al. considered dimensions namely the Management of feedback, Efficiency, Accessibility and Customization for banking service quality according to their types of technology (ATM, telephone banks and internet banks). Johnston  found that factors such as the Attention, Accountability, Care and Intimacy led to the Satisfaction; and the lack of factors such as the Integrity, Reliability, Accountability, Accessibility, and Performance led to the Dissatisfaction. Zeithaml et al. measured the quality of electronic services according to eleven dimensions namely the Accessibility; Ease of Navigation; Productivity; Flexibility; Reliability; Customization; Privacy; Accountability; Assurance/trust; Site aesthetics; and Knowledge value. Zavareh et al. concluded that the Security, Website aesthetics and the Ease of use of internet banking services had positive effects on the customer satisfaction. Gerrard et al. also considered the ability to innovate for fulfilling users' needs in using various features of websites as an important factor in ensuring the success of electronic banking. For instance, providing loans for users, a currency converter, and the mortgage loan calculations on bank websites attract the individual attention. A research in the UK listed five key features namely the Security, Ease of use, Speed and timeliness of services, and diversification of products/ features for the service quality [21,60] confirmed the positive impact of transmission speed, accessibility, ease of use, security, privacy, web design, website content and lower charges on the internet banking adoption. Doll et al. found that five dimensions namely the content quality, accuracy, format, ease of use, and timeliness had a positive impact on user satisfaction in an online space. Jun et al. considered reliable and fast responses and the ease of use as two dimensions of the service quality affecting the satisfaction. Jun et al. and Liao et al. studied the impact of service quality on the customer satisfaction in online banking and found that the quality of support services had a positive impact on the customer satisfaction. Hoffman et al. also found that there was a significant correlation between download speeds and user satisfaction. Jayawardhena et al. found that website features such as speed, website content and design, navigation, interaction, and security made users satisfied. Yang et al. also indicated that the ease of use and usefulness were important factors in evaluating the quality of online services. Parasuraman et al. considered the privacy/security, information content and website accessibility, design, ease of use, and the reliability/realization as dimensions of electronic service quality. Pikkarainen et al. also outlined the ease of use, accuracy, and content as determinants of the customer satisfaction. Investigating the internet banking customers in Pakistan, Raza et al. found that positive and significant relationships of reliability, tangibility, trust and responsiveness with the customer satisfaction. Ayo et al. considered the reliability, accountability, competence, system accessibility, service portfolio, security and privacy as electronic service quality dimensions with a positive impact on e-banking customers' attitudes and satisfaction. Patel et al. confirmed a positive relationship between the perceived ease of use, perceived usefulness, and security on Internet banking customers' behavioral intention in India. Ahmad and Al-Zu’bi  studied relationships of more variables. Ahmad et al. studied determinants of the Internet banking adoption and its relationship with user satisfaction and WOM. Yoon  also investigated factors affecting the internet banking satisfaction. Figure 1 shows the theoretical model of research. Figure 1: A theoretical model. Hypothesis 1: Web design has a significant effect on the Internet banking adoption. Hypothesis 2: Ease of use has a significant effect on the Internet banking adoption. Hypothesis 3: Website content significant effect on the Internet banking adoption. Hypothesis 4: Charge has a significant effect on the Internet banking adoption. Hypothesis 5: Accessibility has a significant effect on the Internet banking adoption. Hypothesis 6: Users' privacy has a significant effect on the Internet banking adoption. Hypothesis 7: Transmission speed has a significant effect on the Internet banking adoption. Hypothesis 8: Security has a significant on the Internet banking adoption. Hypothesis 9: Ease of use has a significant effect on the customer satisfaction. Hypothesis 10: Web design has a significant effect on the customer satisfaction. Hypothesis 11: Transmission speed has a significant effect on the customer satisfaction. Hypothesis 12: Security has a significant on the customer satisfaction. Hypothesis 13: Customer support service has a significant effect on the customer satisfaction. Hypothesis 14: Internet banking adoption has a significant effect on the customer satisfaction. Hypothesis 15: Customer satisfaction has a significant effect on the WOM. A questionnaire was used to collect data, and it was prepared after investigating related papers. The questionnaire consisted of two sections: the first section questioned the demographic information, and the second section included research questions that were evaluated by a 5-point Likert scale ranging from score 1 (strongly disagree) to 5 (strongly agree). The statistical population of research consisted of all Internet Banking customers in Iran's private banks. The research questionnaires were first collected by emails, and thus 850 emails were sent to Internet Banking customers. A total of 132 emails were answered, of which 105 were acceptable. At the second stage, the research questionnaires were distributed through branches of banks in Tehran. Therefore, customers were asked to respond to the research questionnaire if they used Internet banking services. 395 questionnaires were finally analyzed given that Roscoe  reported the suitable number of sample members for the data analysis from 300 to 500. In this research, SPSS22, LISREL and Smart PLS softwares were used for the data analysis; and the Structural Equation Modeling (SEM) was used to test hypotheses and model fit. SEM is a very general and powerful technique from the multivariate regression family which allows the extension of a general linear model, and simultaneously tests a set of regression equations. This model is a comprehensive approach for testing hypotheses about relationships of observed and latent variables. To recognize the nature of the study population and to become familiar with the research variables, it was necessary to describe the data prior to their analysis. The findings revealed that a total number 278 men (79.4%) and 117 women (29.6%) had participated in this study. Other results related to the demographic characteristics information were illustrated in Table 1. Table 1: Descriptive statistics of the study. In order to determine the reliability of the research instrument, internal consistency was used as one of the most commonly used methods for evaluating the reliability of measurement models. It should be noted that internal consistency analysis follows the proposed method for the comparison of three consistency indices (composite reliability, Cronbach’s Alpha, and average variance extracted (AVE) considering the critical value by Bagozzi et al. The indices of internal consistency coefficients were shown in Table 2. All the composite reliability coefficients included more than the critical level of 0.7  and all the Cronbach’s Alpha coefficients had more than 0.7 of it. As a result, it was concluded that the reliability of the measurement models was at an acceptable level. Table 2: AVE and reliability of the questionnaire components. The validity of the measurement instrument was also measured through convergent and divergent validity. It should be noted that evaluation of validity was associated with measuring the ability of the models in order to measure the phenomenon. A powerful way to do this was to check the construct validity via the assessment of convergent and divergent validity of measurement models. The Fornell-Larcker criterion [78,79] for convergent validity is its increased AVE from 0.5, this means that a latent variable can on average account for more than half of the dispersion of its agents. The calculated values of the variables were presented in Table 2. The AVE values could also indicate the convergent validity of the research variables. As well, divergent validity is a complementary concept for which two criteria have been proposed within the Partial Least Squares (PLS). Fornell-Larcker criterion and transverse load testing. According to Fornell-Larcker criterion, a variable should be endowed with more dispersion compared to the agents of other latent variables. Statistically, the AVE of each variable must be greater than the maximum second-order correlation of that variable with other latent variables. Fornell-Larcker criterion evaluates the differential validity at the level of a construct. According to this criterion, the AVE of each variable must be greater than the maximum second-order correlation of that variable with other variables or the squared AVE needs to be lower than the correlation value of the variables. Given the results presented in Table 2, the divergent validity of the research variables was confirmed. The results indicated the acceptable reliability and validity of the measurement instrument (questionnaire). The research hypotheses were investigated through SEM in the next section. Table 3: Confirmatory factor analysis. SEM and LISREL Software (path analysis) were used. The correlation analysis and the divergent validity of the research variables were presented in the general model. According to the results illustrated in Table 4, there was a mutually positive and significant relationship between all the research variables. The AVE values also indicated convergent validity of the research variables. Moreover, the divergent validity of the variables was approved. Statistically, the mean root of the AVE for each latent variable had to be higher than the strongest correlation of that variable with other latent variables. Table 4: Pearson’s correlation coefficient investigating the relationship between research variables. Before testing the hypotheses by the given model, the eight commonly used indices along with the acceptable value of each index suggested in previous studies were used in order to examine the fit of the conceptual model . It should be noted that fit indices could show the fit degree of the conceptual model in this research in terms of measuring the statistical population; in other words, such indices could indicate how much the collected data had supported the research model. Moreover, parameters affecting these indices were different; for example, some of them were highly sensitive to sample size. Therefore, all the indices need to be considered to determine the fit of the model and thus low fit indices of a model in one or more cases would not mean the model was not fit. According to Table 5, it could be concluded that the conceptual model of the present study fitted the data collected. Table 5: Fit indices of the research model. equity is defined as a latent, endogenous, and dependent variable (Figures 2 and 3). 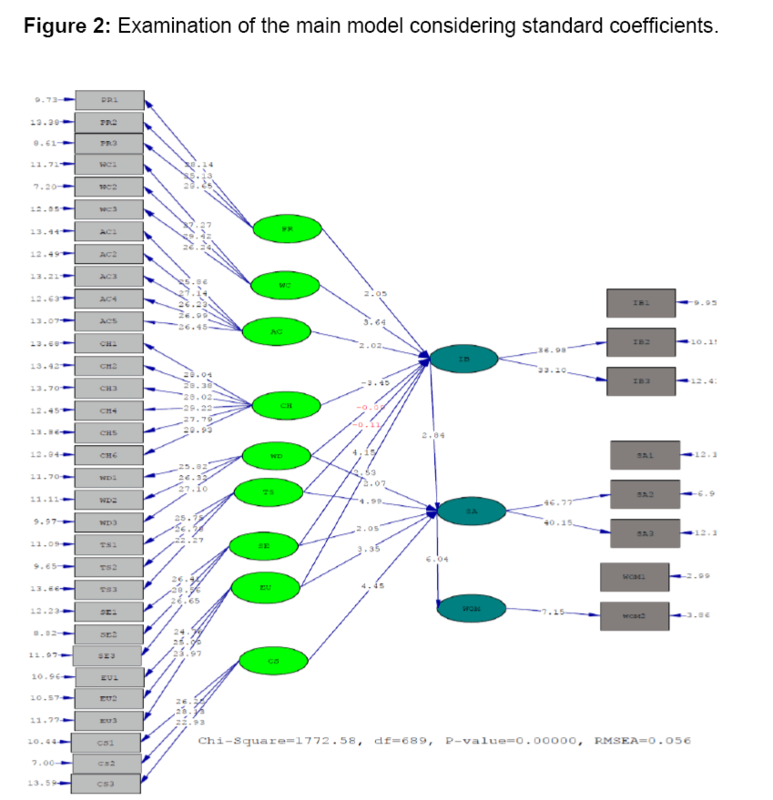 Figure 2: Examination of the main model considering standard coefficients. Figure 3: Examining the main model in T-value. in Table 6. In this study, 15 hypotheses were investigated. Table 6: Investigating the relationships using LISREL Software. A great number of studies have been conducted on the Internet banking. The present study aimed to provide a comprehensive model that examined determinants of user adoption and satisfaction as well as the impact on the positive WOM. According to research results, all hypotheses were confirmed except for two hypotheses (effects of transmission speed and web design on the customer adoption). According to the present research, the web design has a positive effect on the user satisfaction. Result of this hypothesis was consistent with studies by Yoon , Zavareh et al. and Jiang et al. . The positive effect of ease of use on the Internet banking satisfaction and adoption is also confirmed in studies by Saghafi et al. , Sinha et al. , Ling et al. , Serener , Boateng et al. , Momeni et al. , Bagheri et al. , Yoon , Ahmad and Al-Zu’bi , and Sikdar et al. . The confirmation of positive and significant effect of website content on the user adoption and satisfaction is consistent with results of research by Ling et al , Momeni et al. , Yoon , and Ahmad and Al-Zu’bi . The positive and significant effect of accessibility and privacy on the adoption is consistent with studies by Ahmad and Al-Zu’bi . Sikdar et al. also approved the positive and significant effect of accessibility on the satisfaction. It is found that the transmission speed has a positive and significant effect on the adoption and satisfaction, and this result is consistent with results of research by Ling et al. , Momeni et al. , and Yoon . There is a positive effect of security on the Internet banking adoption and satisfaction, and this is consistent with studies by Ling et al. , Sinha et al. , Ahmad and Al-Zu’bi , Yoon  and Momeni et al. . According to research, the users' Internet banking adoption has a positive effect on their satisfaction; and this hypothesis is confirmed by Ahmad and Al-Zu’bi . It is confirmed that providing customer support services increased users' satisfaction. Given that the virtual communication is conducted on online spaces, providing support services is more important than the traditional banking. This result is consistent with studies by Yoon  and Momeni et al. . The present research is useful in both theoretical and applied aspects. A great number of studies have been theoretically conducted by researchers, and most of them have examined factors that lead to the customer adoption, satisfaction or loyalty, while this research simultaneously examined effective factors (by examining significant effects of web design, ease of use, website content, charges, accessibility, privacy, transmission speed and security as the factors contributing to the service quality) on the user adoption, satisfaction and WOM. The research sought to provide a more comprehensive model increasing the richness of literature on the Internet banking. The present research has applied results giving managers a more comprehensive view. In this study, it was found that factors, which first led to the Internet banking adoption, led to the increased user satisfaction and ultimately a positive Word of Mouth for banks in the case of continued provision of high-quality services. This method is more effective than other traditional advertising methods and can provide a wider view for banking managers and internet banking decision makers in different banks and provide clearer goals and more effective strategies to achieve desired goals. Obtained results from this research are also helpful for government officials as they can expand or downgrade the internet banking by enforcing laws. For instance, these laws can be about the way of getting bank charges from users, the security, user privacy, etc. There are limitations on the management research and the study on the consumer behavior (Internet banking users in the present research). The present study is conducted only in Iran, and thus it should be examined in other countries (including developed countries) for higher reliability because cultural differences affect the consumer behavior. So it cannot be generalized to other countries. The research is also cross-sectional, and thus the validity of its results reduces over time. It studied only the impact of satisfaction on WOM, and thus other researchers can investigate other dimensions of customer loyalty. Hanafizadeh P, Keating BW, Khedmatgozar HR (2014) A systematic review of Internet banking adoption. Telematics and informatics 31: 492-510. Makris M, Koumaras V, Koumaras H, Konstantopoulou A, Konidis S (2009) Quantifying factors influencing the adoption of Internet banking services in Greece. International Journal of E-Adoption 1: 20-32. Ram S (1987) A model of innovation resistance. ACR North American Advances. Laukkanen T (2016) Consumer adoption versus rejection decisions in seemingly similar service innovations: The case of the Internet and mobile banking. Journal of Business Research 69: 2432-2439. Tsai HT, Chien JL, Tsai MT (2014) The influences of system usability and user satisfaction on continued Internet banking services usage intention: empirical evidence from Taiwan. Electronic Commerce Research 14: 137-169. Malaquias RF, Hwang Y (2016) An empirical study on trust in mobile banking: A developing country perspective. Computers in Human Behavior 54: 453-461. Rawashdeh A (2015) Factors affecting adoption of internet banking in Jordan: Chartered accountant’s perspective. International Journal of Bank Marketing, 33: 510-529. Alalwan AA, Dwivedi YK, Rana NP, Lal B, Williams MD (2015) Consumer adoption of Internet banking in Jordan: Examining the role of hedonic motivation, habit, self-efficacy and trust. Journal of Financial Services Marketing 20: 145-157. Boateng H, Adam DR, Okoe AF, Anning-Dorson T (2016) Assessing the determinants of internet banking adoption intentions: A social cognitive theory perspective. Computers in Human Behavior 65: 468-478. Al-Ajam AS, Md Nor K (2015) Challenges of adoption of internet banking service in Yemen. International Journal of Bank Marketing 33: 178-194. Martins C, Oliveira T, Popovic A (2014) Understanding the Internet banking adoption: A unified theory of acceptance and use of technology and perceived risk application. International Journal of Information Management 34: 1-13. Alalwan AA, Dwivedi YK, Rana NP, Simintiras AC (2016) Jordanian consumers’ adoption of telebanking: Influence of perceived usefulness, trust and self-efficacy. International Journal of Bank Marketing 34: 690-709. Alalwan AA, Dwivedi YK, Rana NP, Williams MD (2016) Consumer adoption of mobile banking in Jordan: Examining the role of usefulness, ease of use, perceived risk and self-efficacy. Journal of Enterprise Information Management 29: 118-139. Hoehle H, Scornavacca E, Huff S (2012) Three decades of research on consumer adoption and utilization of electronic banking channels: A literature analysis. Decision Support Systems 54: 122-132. Asad MM, Mohajerani NS, Nourseresh M (2016) Prioritizing factors affecting customer satisfaction in the internet banking system based on cause and effect relationships. Procedia Economics and Finance 36: 210-219. Yoon C (2010) Antecedents of customer satisfaction with online banking in China: The effects of experience. Computers in Human Behavior 26: 1296-1304. Ahmad AMK, Al-Zu’bi HA (2011) E-banking functionality and outcomes of customer satisfaction: an empirical investigation. International Journal of Marketing Studies 3: 50. Gupta A, Dev S (2012) Client satisfaction in Indian banks: an empirical study. Management Research Review 35: 617-636. Oliver RL (1980) A cognitive model of the antecedents and consequences of satisfaction decisions. Journal of Marketing Research pp: 460-469. Sayani H (2015) Customer satisfaction and loyalty in the United Arab Emirates banking industry. International Journal of Bank Marketing 33: 351-375. Jabnoun N, Khalifa A (2005) A customized measure of service quality in the UAE. Managing Service Quality: An International Journal 15: 374-388. Wu K, Zhao Y, Zhu Q, Tan X, Zheng H (2011) A meta-analysis of the impact of trust on technology acceptance model: Investigation of moderating influence of subject and context type. International Journal of Information Management 31: 572-581. Harrison T (2003) Why trust is important in customer relationships and how to achieve it. Godwin-Jones R (2001) Accessibility and web design: why does it matter? Language Learning and Technology 5: 11-19. Hackett S, Parmanto B (2009) Homepage not enough when evaluating web site accessibility. Internet Research 19: 78-87. Hackett S, Parmanto B, Zeng X (2004) Accessibility of Internet websites through time. ACM SIGAccess Accessibility and Computing pp: 32-39. ACM. Daniel E (1999) Provision of electronic banking in the UK and the Republic of Ireland. International Journal of Bank Marketing 17: 72-83. Gerrard P, Barton Cunningham J (2003) The diffusion of internet banking among Singapore consumers. International Journal of Bank Marketing 21: 16-28. Davis FD (1989) Perceived usefulness, perceived ease of use, and user acceptance of information technology. MIS quarterly pp: 319-340. Venkatesh V, Davis FD (2000) A theoretical extension of the technology acceptance model: Four longitudinal field studies. Management Science 46: 186-204. Friedman B, Khan Jr PH, Howe DC (2000) Trust online. Communications of the ACM 43: 34-40. Wang YS, Wang YM, Lin HH, Tang TI (2003) Determinants of user acceptance of Internet banking: an empirical study. International Journal of Service Industry Management 14: 501-519. Hutchinson D, Warren M (2003) Security for internet banking: a framework. Logistics Information Management 16: 64-73. Jiang P, Jones DB, Javie S (2008) How third‐party certification programs relate to consumer trust in online transactions: An exploratory study. Psychology and Marketing 25: 839-858. Dong-Her S, Hsiu-Sen C, Chun-Yuan C, Lin B (2004) Internet security: malicious e-mails detection and protection. Industrial Management and Data Systems 104: 613-623. Kesharwani A, Bisht SS (2012) The impact of trust and perceived risk on internet banking adoption in India: An extension of technology acceptance model. International Journal of Bank Marketing 30: 303-322. Proctor RW, Vu KPL, Salvendy G (2002) Content preparation and management for Web design: eliciting, structuring, searching, and displaying information. International Journal of Human-Computer Interaction 14: 25-92. 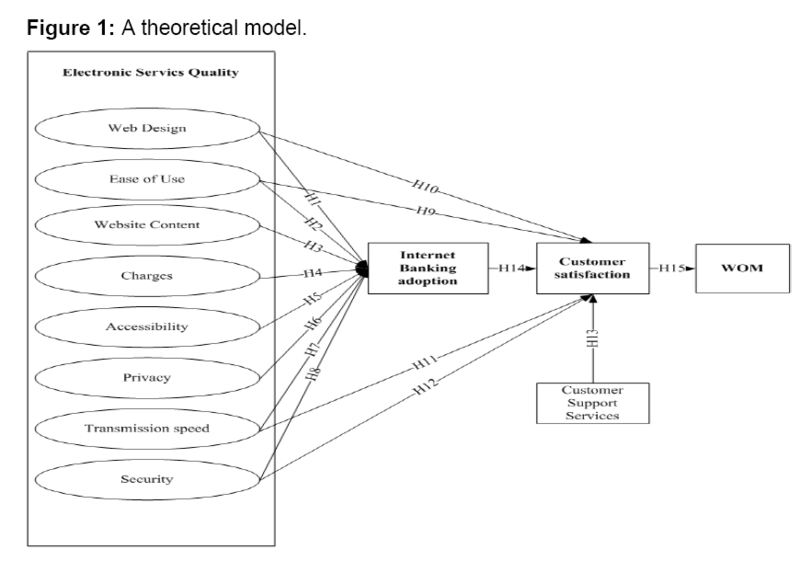 Pikkarainen T, Pikkarainen K, Karjaluoto H, Pahnila S (2004) Consumer acceptance of online banking: an extension of the technology acceptance model. Internet Research 14: 224-235. Rosenfeld L, Morville P (1998) Information Archtecture. Jayawardhena C, Foley P (2000) Changes in the banking sector–the case of Internet banking in the UK. Internet Research 10: 19-31. Jun M, Cai S (2001) The key determinants of internet banking service quality: a content analysis. International Journal of Bank Marketing 19: 276-291. Johnston R (1995) The determinants of service quality: satisfiers and dissatisfiers. International Journal of Service Industry Management 6: 53-71. Rotchanakitumnuai S, Speece M (2003) Barriers to Internet banking adoption: a qualitative study among corporate customers in Thailand. International Journal of Bank Marketing 21: 312-323. Joseph M, Stone G (2003) An empirical evaluation of US bank customer perceptions of the impact of technology on service delivery in the banking sector. International Journal of Retail and Distribution Management 31: 190-202. Brown JJ, Reingen PH (1987) Social ties and word-of-mouth referral behavior. Journal of Consumer Research 14: 350-362. Buttle FA (1998) Word of mouth: understanding and managing referral marketing. Journal of Strategic Marketing 6: 241-254. Datta PR, Chowdhury DN, Chakraborty BR (2005) Viral marketing: New form of word-of-mouth through Internet. The Business Review 3: 69-75. Payne A (1994) Relationship marketing–making the customer count. Managing Service Quality: An International Journal 4: 29-31. East R, Hammond K, Wright M (2007) The relative incidence of positive and negative word of mouth: A multi-category study. International Journal of Research in Marketing 24: 175-184. Silverman G (2011) Secrets of word-of-mouth marketing: how to trigger exponential sales through runaway word of mouth. Amacom Books. Ainscough TL (1996) The Internet for the rest of us: marketing on the World Wide Web. Journal of Consumer Marketing 13: 36-47. Yang Z, Jun M (2002) Consumer perception of e-service quality: from internet purchaser and non-purchaser perspectives. Journal of Business Strategies 19: 19. Joseph M, McClure C, Joseph B (1999) Service quality in the banking sector: the impact of technology on service delivery. International Journal of Bank Marketing 17: 182-193. Zeithaml VA, Parasuraman A, Malhotra A (2000) Conceptual Framework for understanding e-service quality: Implications for future research and managerial practice. Zavareh FB, Ariff MSM, Jusoh A, Zakuan N, Bahari AZ, et al. (2012) E-service quality dimensions and their effects on e-customer satisfaction in internet banking services. Procedia-Social and Behavioral Sciences 40: 441-445. White H, Nteli F (2004) Internet banking in the UK: Why are there not more customers? Journal of Financial Services Marketing 9: 49-56. Doll WJ, Torkzadeh G (1988) The measurement of end-user computing satisfaction. MIS quarterly pp: 259-274. Jun M, Yang Z, Kim D (2004) Customers' perceptions of online retailing service quality and their satisfaction. International Journal of Quality and Reliability Management 21: 817-840. Liao Z, Cheung MT (2008) Measuring consumer satisfaction in internet banking: a core framework. Communications of the ACM 51: 47-51. Hoffman DL, Novak TP, Peralta M (1999) Building consumer trust online. Communications of the ACM 42: 80-85. Yang Z, Fang X (2004) Online service quality dimensions and their relationships with satisfaction: A content analysis of customer reviews of securities brokerage services. International Journal of Service Industry Management 15: 302-326. Parasuraman A, Zeithaml VA, Malhotra A (2005) ES-QUAL: A multiple-item scale for assessing electronic service quality. Journal of Service Research 7: 213-233. Pikkarainen K, Pikkarainen T, Karjaluoto H, Pahnila S (2006) The measurement of end-user computing satisfaction of online banking services: empirical evidence from Finland. International Journal of Bank Marketing 24: 158-172. Raza SA, Jawaid ST, Hassan A (2015) Internet banking and customer satisfaction in Pakistan. Qualitative Research in Financial Markets 7: 24-36. Ayo CK, Oni AA, Adewoye OJ, Eweoya IO (2016) E-banking users’ behaviour: E-service quality, attitude, and customer satisfaction. International Journal of Bank Marketing 34: 347-367. Patel KJ, Patel HJ (2018) Adoption of internet banking services in Gujarat: An extension of TAM with perceived security and social influence. International Journal of Bank Marketing 36: 147-169. Roscoe JT (1975) Fundamental research statistics for the behavioral sciences. Bagozzi RP, Yi Y, Phillips LW (1991) Assessing construct validity in organizational research. Administrative Science Quarterly pp: 421-458. Nunnally J (1978) Psychometric methods. Yoon C, Kim S (2009) Developing the causal model of online store success. Journal of Organizational Computing and Electronic Commerce 19: 265-284. Aladwani AM, Palvia PC (2002) Developing and validating an instrument for measuring user-perceived web quality. Information and Management 39: 467-476. Suh B, Han I (2003) The impact of customer trust and perception of security control on the acceptance of electronic commerce. International Journal of electronic commerce 7: 135-161. Rod M, Ashill NJ, Shao J, Carruthers J (2009) An examination of the relationship between service quality dimensions, overall internet banking service quality and customer satisfaction: A New Zealand study. Marketing Intelligence and Planning 27: 103-126. Fornell C, Larcker DF (1981) Structural equation models with unobservable variables and measurement error: Algebra and statistics. Journal of Marketing Research pp: 382-388. Hair JF, Anderson RE, Tatham RL, Black WC (1998) Multivariate data analysis. Upper Saddle River. Joreskog KG, Sorbom D (1996) LISREL 8: Structural equation modeling. Scientific Software International Corporation, Chicago. Bentler PM (1990) Comparative fit indexes in structural models. Psychological Bulletin 107: 238. Bagozzi RP, Yi Y (1988) On the evaluation of structural equation models. Journal of the Academy of Marketing Science 16: 74-94. Etezadi-Amoli J, Farhoomand AF (1996) A structural model of end user computing satisfaction and user performance. Information and Management 30: 65-73. Saghafi F, Moghaddam EN, Aslani A (2017) Examining effective factors in initial acceptance of high-tech localized technologies: Xamin, Iranian localized operating system. Technological Forecasting and Social Change 122: 275-288. Sinha I, Mukherjee S (2016) Acceptance of technology, related factors in use of off branch e-banking: an Indian case study. The Journal of High Technology Management Research 27: 88-100. Ling GM, Fern YS, Boon LK, Huat TS (2016) Understanding customer satisfaction of internet banking: A case study in Malacca. Procedia Economics and Finance 37: 80-85. Serener B (2016) Statistical analysis of internet banking usage with logistic regression. Procedia Computer Science 102: 648-653. Momeni M, Kheiry B, Dashtipour M (2013) Analysis the Effects of Electronic Banking on Customer Satisfaction and Loyalty (Case Study: Selected Branches of Melli Bank in Tehran). Interdisciplinary Journal of Contemporary Research in Business 4: 230-241. Bagheri MA, Beheshti MTH, Alidousti S (2009) Acceptance of Internet Banking In Iran; Extension of Technology Acceptance Model (TAM). Iranian Journal of Information Processing and Management 24: 5-33. Sikdar P, Kumar A, Makkad M (2015) Online banking adoption: A factor validation and satisfaction causation study in the context of Indian banking customers. International Journal of Bank Marketing 33: 760-785.